A luxury high-rise complex in Houston Texas has at its fortieth storey a large outdoor swimming pool—which is impressive in itself. This “cantilevered” pool, however, has a unique, transparent overhanging section that’s not for anyone with a fear of heights that lets one float forty floors above street traffic. 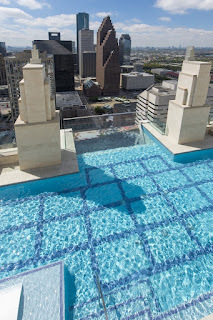 View more images and video footage of the Sky Pool of Houston’s Market Square at the link above.